Alera is a public company in the furniture industry that is an internet based retailer of office furniture and business products designed to meet the needs of every offices sizes and all levels of employees across a broad range of professional industries. Alera offers high quality furniture that is comparable to large name brands at big box stores. Alera has been successful with the convenience and cost effective online shopping from your home or office. 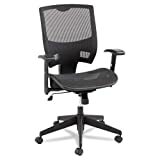 Alera Epoch Series All Mesh Multifunction Mid-Back chair, Black Back Seat has a product dimension of 29.5 x 25.6 x 14.2 inches and weighs in about 48.5 pounds. This chair is aesthetically designed for contemporary feel. The pneumatic seat height adjusts from 19” to 24”. The chair is made of mesh which offers a lot of ventilation and helps keep employees cool as they sit and work for a long period of time. Another advantage of mesh type is it requires minimal maintenance since employees back stay dry. The design of Alera Epoch is very modern, thanks to their slim profiles. The black breathable mesh covered curved back encourages it’s user to sit at a proper posture. This chair has a ratchet back height adjustment and provides customized lumbar support for your lower back. The back reclines at 2 to 1 angle to the seat allowing user to recline while keeping seat relatively even with the floor. The mesh suspension seat provides firmness and support. Adjustable armrests help relieve shoulder strain. The height and width adjustable polypropylene T-bar armrests offer primal positioning to provide maximum comfort while resting or typing. This chair is very sturdy and durable with it’s black nylon 5 star base with casters for easy mobility. Chair also swivels for a complete range of motion for better multitasking. For optimal positioning this chair offers tilt control. Adjustable tilt tension lets you determine the amount of pressure required to lean back in your chair, while tilt lock lets you set the chair into its upright position. Mid-back height chairs are usually up to the shoulders of the users. These types of chairs are ideal for employees typing on computers for most parts of the day.Alera Epoch meets or exceeds ANSI/BIFMA performance standards. The chair has met quality standards for safety and durability established by the American National Standards Institute (ANSI) and the Business and Institutional Furniture Manufacturers Association (BIFMA). Easy assembly instructions are included. The price is a little higher than normal but Alera Epoch is backed by the manufacturer’s 5 year limited warranty. Its price sounds a little expensive but the longevity and comfort it gives is worth it. Customers rated it as 4.5 stars in Amazon as well. 匿名sPathetic is my word for you all. If you don’t even have the gut to show your name, why bark here?Allow me to make the assumption, you all are girls, girls who enjoy hnivag your “dogs” carrying handbags for you. Thus this post conflicts with your interests.As for the last 匿名 who dare Mr. Chan to close the blog, why don’t you show your face first?Try to read your entry before posting, just because you call yourself 匿名 doesn’t mean you don’t embarrass yourself. ‘Ole’ por el pueblo espaÃ±ol en esos momentos, capaces de oponerse al Rey para formar una repÃºblica.Aunque esa repÃºblica serÃ­a derrocada en el 1936 por otro golpe de estado, permitiÃ³ unos aÃ±os de avance social, sobre todo durante los aÃ±os 1931-1933 en los que goberno la Izquierda. this is why so many white men feel they have to become black men to get white womenSo..white men have to become "wiggas" to get white women? I really have to disagree with you on that. tak jak napisaÃ…Â‚em, nie chcÃ„Â™ wnikaÃ„Â‡, które jest bardziej intuicyjne – to jest indywidualna sprawa kaÃ…Â¼dej osoby. fakt, KDE jest bardziej konfigurowalne, jednak dla “zielonego” uÃ…Â¼ytkownika przenoszÃ„Â…cego siÃ„Â™ z Windows na Ubuntu Gnome jest przyjaÃ…Âºniejszym Ã…Â›rodowiskiem. Tu chyba dziaÃ…Â‚a ten sam mechanizm co w przypadku Opery – Opera jest super, ma mnóstwo opcji, jednak wiÃ„Â™kszoÃ…Â›Ã„Â‡ uÃ…Â¼ytkowników i tak wybiera prostego Firefoksa. KDE moÃ…Â¼e jest fajne i intuicyjne, ale dla zaawansowanego uÃ…Â¼ytkownika, który wie, co i jak sobie skonfigurowaÃ„Â‡.